Wait until it is safe to do so, then gradually re-enter the roadway. Turn back onto the roadway immediately. If your wheels drop off the roadway or pavement edge, do not attempt to turn back onto the roadway immediately. Instead, reduce your speed, check traffic, and gradually turn back onto the roadway when it is safe to do so. Stop until the other driver passes. Glance toward the right edge of your lane. To avoid being blinded when driving at night, do not look directly at the headlights of oncoming cars. Instead, look toward the right edge of the road until the oncoming driver has passed. School zone or school crossing sign. A five-sided sign is used to alert drivers to a school zone. 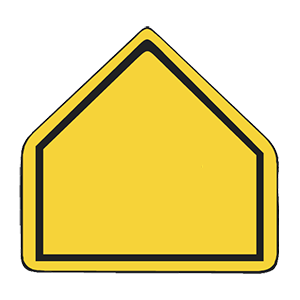 Some pentagonal signs specifically indicate crosswalks within school zones where children or other pedestrians may be present.